Even this obscure blog has been nominated for an award or two, putting me into a quandary. Most blog awards come with the expectation that the recipient answer some questions about themselves and nominate some number of other blogs. To anyone who has deemed this blog worthy of an award, I appreciate the consideration. I welcome your comments on any of my posts, and encourage readers to check out the excellent blogs I follow. Scroll down until you see them in the sidebar. ← Formatting: Frustration, Fits and… Fun! 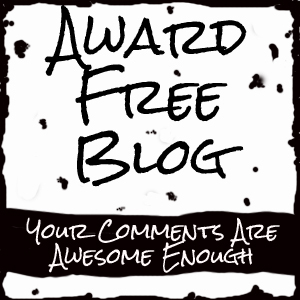 I hereby award you with the”Award-Free Blog of the Year Award”!!! Indeed, time is the ultimate scarce resource, and each of us has to decide how to use it. I’ve only been awarded an award twice, I think. On the one hand I don’t mind them because it gives me something to write a blog post about when ideas are thin on the ground, but like you, I don’t like the ‘chain letter’ element. I blame the people who came up with the concept in the first place. If you think the blogger awards are bad you should see the ones that do the rounds on Flickr. The rules and regulations are apocalyptic and woe betide anyone who doesn’t follow those conditions to the letter.